Along with the thrill of writing, came the growth of the community of readers and the fantastic network in the comments section. Atoke’s Monday Morning became OUR thing on BellaNaija. I loved it, and even more fantastic for me was the fact that I was faceless. 🙂 I enjoyed the anonymity of it for two reasons: I could write and hide behind my computer, and secondly because I wanted my work to do talking – without any distractions. However, a life without innovation and evolution is kinda boring you know? 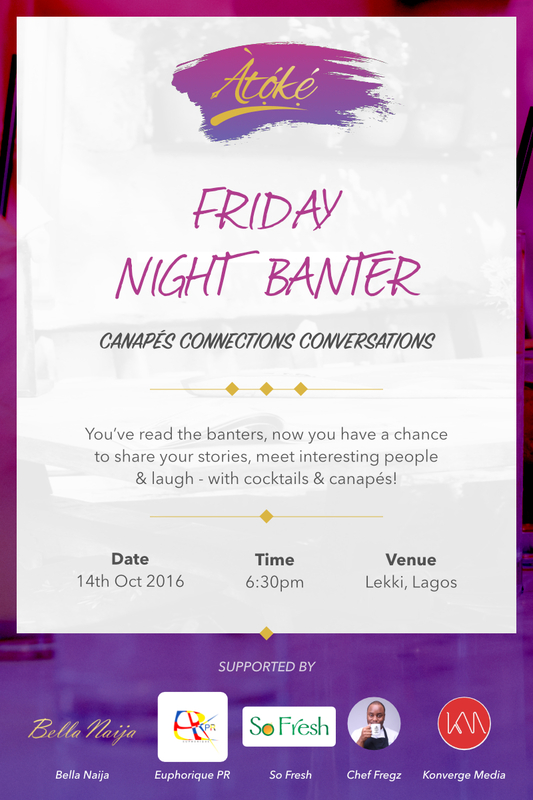 So, I’m going to bring Banter to life by hosting an evening with you guys in Lagos. We’re going to pick some of our favourite Banter pieces, talk about the issues raised and we’ll have a chance to network and generally have fun. You get to choose which of the pieces I wrote in the course of three years. It seems like such a tedious task eh? I mean, this is not counting the things I wrote before October 2012, and then BN Hot Topic days. (Nobody should remind Uche that I dropped the ball on this!) Anyway, I’ve tried to choose a few that I think you guys might like to choose from, but you can always click on my profile to see old pieces. So, I’ve tried to narrow down 10 topics to choose from. Of course you can always tell me any one not on this list which you think will make for more interesting discourse. I’ve shared this idea with a few people and they’ve graciously agreed to come on as partners for the evening. 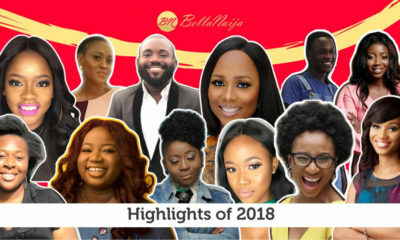 Special shout out to the BellaNaija Team. My amazing friends and colleagues who helped me beat this project into place. 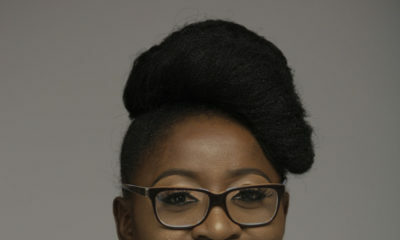 Moremi Amuta of Euphorique PR who has done all the hard work and I’m just basically stepping in to take the shine of her hard work. Gbubemi Fregene of Chef Fregz catering whose love and support for me is always unwavering. Shola Aromokun of Konverge Media who offered us his services without flinching. And of course my beloved cousin & his wife Goke and ‘Bimbo Balogun, the awesome duo behind SoFresh. Family is everything! I look forward to having a fun evening with you lovely people who read my work. However, we only have room for 20 people so you have to RSVP before the 10th of October. If you wanna come and spend the evening with us, please send an email to atokeofficial(at)gmail(dot)com with ‘Canapés. Connections. Conversations’ in the subject bar. In the body of the email, tell us three of your favourite articles, why you liked them and a confirmation that you’ll be available in Lagos on Friday the 14th of October, 2016. You’ll be mailed an invite with details of the venue of the event. Peace, Love & Celery sticks. Lol… Girl!!! Like I expect anything less… Pfft! Unfortunately, I won’t be in Lagos to attend this gtg. My favorite topic by Atoke is “If wishes were horses” posted on the 25th of March 2013, I responded by revealing my personal wish, people dragged me….but…. I got my wish….looking back now, I believe that particular post helped to shape how I saw myself, most importantly, it made me write down all I wanted and then, I worked towards them gradually….. God bless you Atoke. Aww This really made me smile. Thanks so much for sharing this experience and I’m so happy that something I wrote helped you shape things for the better. Yayyyy! I will definitely be attending when I enter Lagos! Congrats on your new project Atoke! I’m so excited…this is a very innovative way to finally have a BN meet-up! 2. More importantly, will you be writing about the hangout? You know like a feature with photos? Abeg carry the rest of Nigeria and the world along. 2: Yes, I will be writing about the hangout… and yes there will be photos. Lol.. I think. And yes, I look forward to seeing you. Hey, we have to get name tags for everybody so we can properly network! Lol Sorry na! It’s a flying visit. I’m in a Lagos for a very short time ni. Oya don’t be mad. Okay? Oh this is a fab idea! I definitely will try to attend. I was gonna suggest you consolidate all your beautiful articles into a book and then I saw your comment to Californiabawler ?. I will bring a bottle to share with you. Your email had me rolling!!!!! Perraps, Atoks will take this roadshow international and it’ll reach jand… Father, please look upon the endeavour begun by your daughter with Favour and show her more Grace by causing it to open wider doors for her, in Jesus Name. Biko, you people should help me entreat C-Bawler not to kidnap chef fregz – some of us are still hoping to enjoy culinary offerings in his restaurant one day. The days when Atoke used to give us cupcakes and love. ? Fitfam changed it to celery sticks and carrots. ? Life and all its evolving. Wish I were in Lagos, would have gatecrashed if I didn’t get an invite! Well done babess. You’ve come a mighty long way! See how Atoke is only replying people she likes on the blog, You cannot reply Mr. Egghead abi? 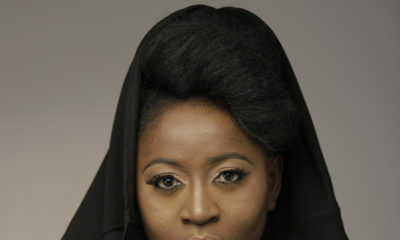 Miss Atoke? Atoke don’t be doing portharcourt people like this oh! But then again I don’t flying down…. My best Atoke’s article was the ying to my yang! Chia I poured my heart out in the comment section! Years down the line I found the ying to my yang!